Not even Cardi B could have predicted just how much motherhood would impact her. As she continues to enjoy life at home with daughter Kulture Kiari Cephus and husband Offset, the rapper took a night off from mommy duties to sit front row at Tom Ford's New York Fashion Week show. 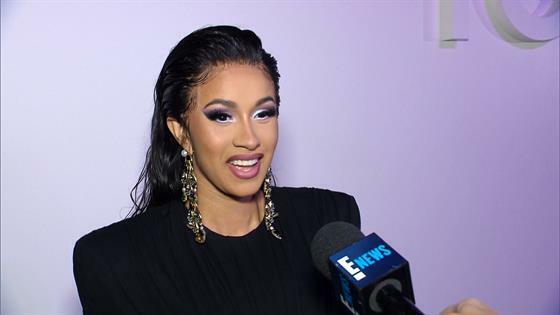 Cardi soaked in every moment of the evening, telling E! News in an interview that she was looking forward to "showing my after pregnancy body, like what's good?!" The "I Like It" emcee did exactly that in a black bodycon dress by Tom Ford that showcased her silhouette, which she paired with dramatic statement earrings and a slicked back 'do. It didn't take long for Cardi to shift the conversation to her little girl and how "amazing" it is to watch Kulture grow up. "It's the best feeling in the world," she gushed. "I love it. This is what I was missing my whole life? I love it!" Baby Kulture wasn't the only reason for Cardi's celebration, of course! Snagging a spot next to Anna Wintour, Tom Hanks and Crazy Rich Asians star Henry Goldingat the fashion show is no small feat and didn't go unnoticed by the Bronx native. "I CAME A LONG F--KING WAY," she captioned an Instagram post. "First things first, I spend so much money on Tom Ford sh-t, I deserve to be here," Cardi also told WWD. "All that g-ddamn money I spent, it's about time I'm here." Cardi gave birth to her first child in July, but aside from a few small glimpses, has yet to officially introduce Kulture to the world. Like any new mama, the 25-year-old has decided to keep this aspect of her personal life exclusive to her nearest and dearest. As a source previously explained to E! News, "Cardi is obsessed with Kulture and is already very attached and overprotective. She has let her family and a few friends see the baby, but has mainly been spending a lot of time alone at home with Offset." Hear more from Cardi by pressing play on the video above!